Which Pair Will You Be Wearing? Who said that black can't be worn in the summer, or pompoms should be left for good in the girl's section of local department stores? This summer, defy the odds and break fashion "rules" by picking up a new pair of summery heels. Scroll through this list of some of the trendiest yet groundbreaking styles of heels and see which style suits you the most. The print that made its epic comeback this summer, gingham heels are all the buzz. Pair these heels with your favorite pair of jeans, solid colored sundress, or even a short suit set and you will have heads turning! Light blue heels are definitely in style this season and to be completely fair, they have every right to be! This color goes so well with all shades of denim, pastels, and even prints that it wouldn't make sense not to pair these with classic staple pieces in your closet. One of my personal favorites on this list, zip-up heels are the edgy heel everyone should have in their lives. 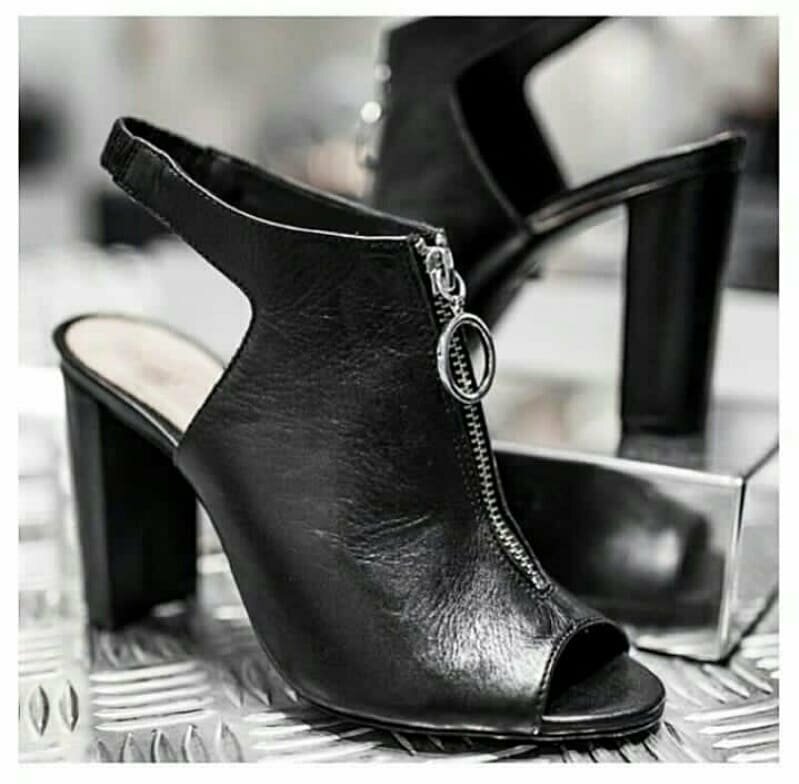 Since I have such a love for combat boots and zip-up boots, these heels are definitely ones I would incorporate in my day to day wardrobe. They have the ability to give a look the perfect edge needed to bring a look from an 8 to a 10. Millennial Pink has been very trendy since 2016, but that does not mean this shade of pink is going out of style anytime soon. Pairing this color shoe with an outfit is sure to not just give your outfit a girl touchy but brownie points in any stylist's book. While the pair pictured above is more of sandal, any version of a brown neutral heel will be sure to compliment a summery outfit in the best way possible. Personally, I always lean towards pairing most outfits with black shoes, but in the hot summer months, brown shoes will give your look a light and more bohemian vibe that you may never want to wear a black pair of shoes again. Whether they are faux or authentic, snakeskin heels are such a statement piece that they will most certainly be the game changing piece in your closet this summer. These heels are so cute and playful that they can make even the plainest of outfits look stylish! Also, I've noticed some stores and websites sell pompom totes and wristlets that would definitely complete this look in the most fashionable way possible. Whether it's a night on the town or a graduation party, blinged out heels will give any dress, romper, or jumpsuit the attention it deserves! While blingy heels come in any color, it is best to pick up silver, bronze, and gold tones first as they usually go with the most patterned and colored outfits. By far one of the most iconically classic heels on this list, black strappy heels have never gone out of style and hopefully they never will. Stars for decades have popularized this shoe in the media and because of its popularity, you can find this type of heel in almost any department store or shoe store. No matter the height or style of the heel, yellow pointed heels are IN season. Yes, they are bold and rather eccentric for some settings and occasions, but they demand attention and that is what I love about them! It is that time of year that everyone in school may be struggling or trying to pull through the last couple of weeks and finals coming up. Since I am experiencing a time in my life of transitioning to "real life" from the four year college life, it is important to value and believe in yourself especially outside of school. I have come to a realization this semester that it is so important to believe in yourself and take care of yourself in your personal life because you will feel happier and less stressed out. I have called the University of Arizona my home four years ago and now I am going to leave it soon. People in this society think it is easy to transition from college to the real world but unfortunately, it is not. The University of Arizona was so meaningful to me these past four years. It has made me grow, boost my self-confidence, develop critical thinking skills, and meet so many friends that I am sad to leave. At the end of college, I will have thoughts about what I would want and wish for in my future? Why is it so difficult to leave this type of life I made myself? I have been a part of so many clubs and communities on campus that changed my life completely and I would not be the same without them. In the moment of transitioning to the real world, I want to wish all my friends that are staying at the University of Arizona the best. My life is going to change but I will still stay in contact with my friends while I am transitioning to the 'real world' and my incoming future job. As a graduating senior, some people say to me aren't you so happy to leave college? The answer is yes and no. Why would I be happy to leave a community that made me grow so much? It is challenging to leave college because the last four years I developed a new life for myself and now I am in the process of applying to jobs to start my career.